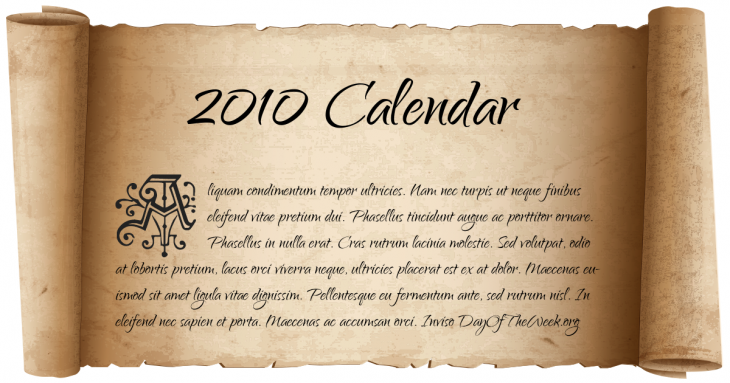 February 14, 2010 – New Year’s Day in Chinese calendar. Start of the year of the Metal Tiger in Chinese astrology. February 27, 2010 – An earthquake measuring 8.8 on the Richter scale strikes central parts of Chile leaving over 500 victims, and thousands injured. The quake triggered a tsunami which struck Hawaii shortly after. April 14, 2010 – Nearly 2,700 are killed in a magnitude 6.9 earthquake in Yushu, Qinghai, China. June 4, 2010 – Falcon 9 Flight 1 was the maiden flight of the SpaceX Falcon 9 rocket, which launched from Cape Canaveral Air Force Station Space Launch Complex 40. July 2, 2010 – The South Kivu tank truck explosion in the Democratic Republic of the Congo kills at least 230 people. August 19, 2010 – Operation Iraqi Freedom ends, with the last of the United States brigade combat teams crossing the border to Kuwait. August 31, 2010 – The last episode of The Bill, the longest-running police procedural television series in the United Kingdom, is aired on ITV1. September 4, 2010 – Canterbury earthquake: a 7.1 magnitude earthquake which struck the South Island of New Zealand at 4:35 am causing widespread damage and several power outages. October 25, 2010 – Mount Merapi in Central Java, Indonesia, begins over a month of eruptions. November 19, 2010 – The first of four explosions takes place at the Pike River Mine in New Zealand; 29 people are killed in the nation’s worst mining disaster since 1914.
Who Was Born On 2010?